Pictured is Curtis Pass, 19, of formerly of Brindley Court, Killamarsh, who has been jailed for 32 weeks after causing criminal damage, breaching a restraining order and breaching a suspended sentence. A nightmare teenage son who breached a suspended prison sentence and a restraining order by continuing to hound his mother at her home has been jailed for 32 weeks. Chesterfield magistrates’ court heard on Friday, August 26, how 19-year-old Curtis Pass turned up at his mother’s address in Killamarsh and was banging on the door before breaking the frame and bracket of a window on August 24. Prosecuting solicitor Becky Allsop said Pass had previously taken his mother’s car without permission and caused damage at her home. She explained Pass had taken his mum’s vehicle in June and it was found abandoned with billowing smoke and on the same day Pass had visited his mum’s address and tried to smash his way in and damaged was caused. Pass continued to pester his mum and in July he damaged a window and wing mirror on her vehicle, according to Mrs Allsop. Despite being given a 12 month restraining order and a 16 week custodial sentence suspended for 12 months for these offences, Mrs Allsop explained that Pass went on to visit his mother’s home on August 24 and broke a window after threatening to damage his mother and auntie’s cars. She said he pulled at an open window and broke the frame and bracket and the defendant fled when he realised someone was phoning the police. Mrs Allsop added that his mother claimed Pass has been “hounding and threatening” her for money and she feels likes she is going to have a breakdown because she is living in fear of her son. Pass, formerly of Brindley Court, Killamarsh, admitted breaching his restraining order and his suspended prison sentence and pleaded guilty to damaging a window. 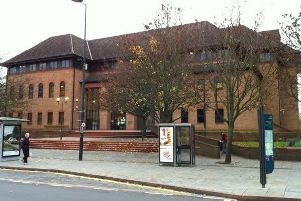 He also pleaded guilty to driving without a licence and without insurance after an incident on August 25. Defence solicitor Felicity Coats said his mother had still wanted some contact but she did not want Pass to come to the family home. Magistrates sentenced Pass to a 32 week custodial sentence and ordered him to pay a £115 victim surcharge. His driving licence was also endorsed with six points. Pass, of No Fixed Abode, was also acquitted of making threatening facebook and phone messages in an unrelated matter but he was given a further 12 month restraining order not to contact those connected to this case.